The “Blog” of “Unnecessary” Quotation Marks: also "great and powerful oz"
This one, submitted by Jeremy in Oklahoma, is a bit hard to read. It says "expect a miracle 'God' is waiting for YOU. Praise Fellowship (etc)". 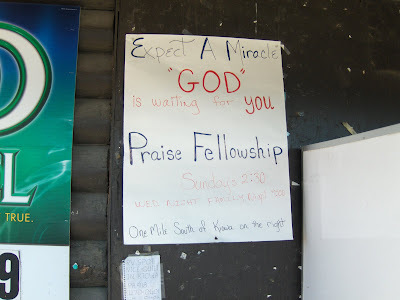 I don't know what kind of miracle they are expecting or if God is actually waiting, or really just the pastor. Their punctuation: less than miraculous. Mett "God" at the church with the "Cross"
seeing someone embellish a hand-written sign so -with the scrolly writing and the alternating of colors and different "fonts"- only to have it turn out off-center and uneven and ugly and hard to read is as embarassing to me as the american idol rejects who really, really think they can sing, but who are completely tone deaf. this one isn't as bad as some, and i'm probably going to hell for that, but i'm just saying..ick. From my perspective, "god" is a word tat should always be in QMs. I approve. HAHHAHA KIOWA!!! I live near there! In fact, I probably know the people who own those phone numbers. Also, I'm pretty sure the church mentioned has notoriously crummy signs.